I don’t foresee anyone making a funnier three-hour film about the stock market than Martin Scorsese’s THE WOLF OF WALL STREET. In all fairness, to claim that the whip-paced, sublimely irreverent film is actually about the stock market would be like describing THE SHINING as a movie about hotel maintenance. Wall Street is merely the stage - the geographic center of a metastasizing empire built from money, drugs, women, and drugs. Primarily money… but also mostly drugs. 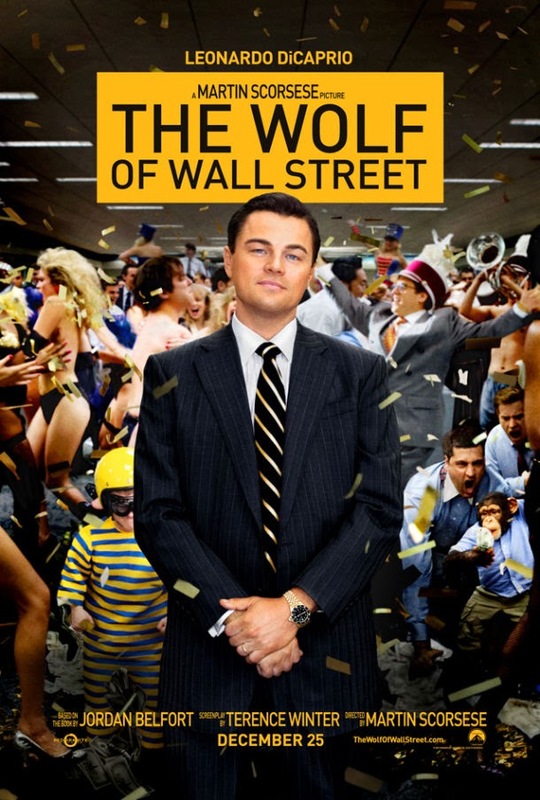 Adapted by Boardwalk Empire showrunner Terence Winter from two memoirs by disgraced stockbroker Jordan Belfort, WOLF chronicles Belfort’s (Leonardo DiCaprio) meteoric rise and subsequent meteoric plummet from New York’s Wall Street, where he used small potato penny stocks and a motley crew of petty criminals to cheat his way to the top. Beginning with Belfort’s first snort of cocaine, courtesy of veteran broker Mark Hanna (Matthew McConaughy) (whose other stock trading advice includes chronic masturbation and the liberal application of vodka martinis), the film is also a testament to Belfort’s self-admitted drug addiction, and to the hedonistic alchemy that occurs when a bottomless wallet meets an infinite pharmacy. And who better to portray the dashing, voracious Belfort than regular Scorsese collaborator Leonardo DiCaprio? Daily skirmishes with bombshell wife Naomi (Australian-born Margot Robbie), soapboxing motivational speeches on the trading floor, caustic banter with FBI agent Patrick Denham (Kyle Chandler): these are all scenes to which we know Leo is perfectly suited. And he doesn’t disappoint. Where he downright excels, though, is during innumerable bits of gonzo physical comedy. Supported by Jonah Hill, who plays Belfort’s WASPish, dumpy business partner, DiCaprio writhes, punches and tumbles his way through a cavalcade of Quaalude binges, coke highs and good ol’ fashioned alcoholic benders, stopping for just long enough to molest a stewardess or huck a Velcro-swaddled dwarf at an oversized target. DiCaprio’s most active off-screen accomplice in WOLF’s dazzling showcase of Libertine shenanigans is Scorsese himself, who employs many of his usual techniques – voiceover, non-linear chronology, innumerable music cues and an oft-moving camera – to exaggerated effect, giving the film a gloriously loopy, carnivalesque feel. Likewise, he knows exactly when to slow things down for a character beat, when to momentarily halt a caper with a nugget of dramatic resonance. The whole piece is a thrilling tonal balancing act that only stumbles in the necessarily serious final half hour (the first time I felt even remotely conscious of the film’s sturdy runtime). It seems impossible not to compare WOLF to both GOODFELLAS and CASINO as all three are epically lengthy ensemble cast films dissecting the experiences of organized men strong-arming their way through the backdoor of the American dream. Understandably inferior to GOODFELLAS and better than CASINO (which I still think is totally underrated, but whatever), WOLF is equally striking in its differences. In Scorsese’s mob pictures, the mafia is an exclusive group that has an explicit set of values dictating the way it treats its members, its allies and its enemies. Sons and daughters are born into membership, and a fierce loyalty to its kith and kin is a foregone conclusion. 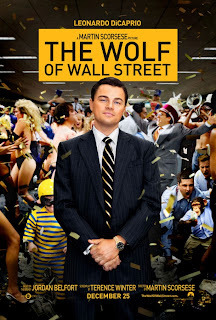 Conversely, THE WOLF OF WALL STREET portrays the stock market as a world populated through the democratization of greed, with Belfort’s firm acting like a demented Ellis Island for everyday strivers desperate to forge new lives through sheer force of greed – the tired, the hungry, the amoral. Balfort’s universe doesn’t value birthrights - only the wanton money-hunger of the individual. Loyalty is the ultimate weakness. Great review, fabulous film. DeCaprio and Scorsese and ensemble: Kudos! Scorsese's THE WOLF OF WALL STREET is very much the new millenium's zeitgeist movie for me. This is rich, interesting filmmaking at every level. It shouldn’t be judged for its more repellent moments - and there ARE a lot of them - but for its breakdown of old mores that are still very much with us. The emotional nastiness of its satire very much has a point. The political satire in It's pretty jejune in my opinion. Martin Scorsese is back at his best with this rollicking update on the gangsters of New York, the mean streets now filled with stockbrokers and share dealers, driven characters in search of the good life the easy way.